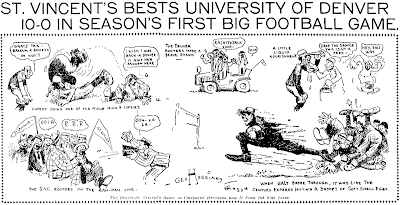 Sunday, October 20 1907 -- St. Vincent's College of Los Angeles (now Loyola Marymount University) upsets the University of Denver as college football season gets underway. 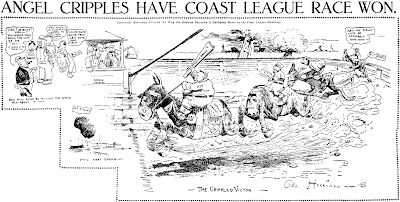 Sunday, October 20 1907 --With just two weeks left to go in the Pacific Coast League season, the Angels have an almost insurmountable lead and are cruising in to a first place finish. The team has a long list of walking wounded, but manager Hen Berry has shepherded them through and is already busily accepting accolades as the de facto champion. Have I mentioned how much I enjoy "Herriman Saturdays"? Yeah, I probably have, but I'll say it again! Thanks Jeff; this is the hardest type of post for me to produce (the photocopies need a LOT of touch-up) and it's good positive reinforcement to know that folks are interested in the results. We've met A.T. "Crite" Crichton before on the blog; here's one of his longer running series. He must have been extra proud of this one as he signed it with his full name. Swapping Silas Comes to Town first ran in the Boston Herald's Sunday section in 1906 from May 13 to October 28, then made a return engagement, title now shortened to just Swapping Silas, from January 19 to February 9 1908. Say what you will of the quality of humor here, but for the Herald, usually free of even the vaguest whiff of a well-told joke, this was comedy gold. Our sample of the strip, featuring the latest in eye-curdling gentleman's haberdashery, comes from fashion maven Cole Johnson. Above is the first disjointed week of Little Nell, the story of a small-town girl who goes to the big city to seek her fortune. Gene Carr produced this short-running strip for United Feature Syndicate from December 12 1927 to April 14 1928. 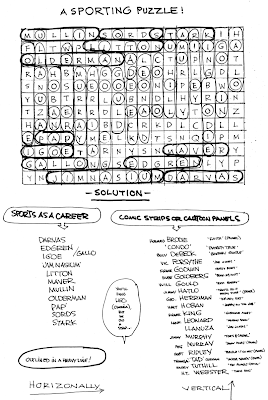 In Carr's long career he made only this one attempt to do a serious continuity strip, and showed that there was no good reason to try a second. The first week gives the impression of about six weeks of continuity edited with a rusty chainsaw down to one. The most interesting aspect of this first week is the impression that our heroine just might have an unusual ambition -- to become a psychoanalyst. No such luck though. Once Nell makes it to the big city it is revealed that she want to be -- what else? -- a stage star. In the ensuing four months Nell never goes on an audition, never gives any impression of having talent of any sort, seemingly no ambition whatsoever. What she excels at is weeping continually and uncontrollably. She gets a room in a boarding-house and bawls at the landlady, makes friends and sobs all over them, finds an agent to cry at, whimpers at a sugar-daddy, howls at Lotharios, and snivels as the landlady throws her out for not being able to make rent. In the final week of the strip she takes a train back to her hometown (conductor soaked), goes back to ma and pa (drenched) and introduces us to her gal-pal Mary Ann Gay (doused). Nell blubbers to us readers that this girl, who hopefully isn't quite so prone to water-works, is on her way to the big city to work at a newspaper. The next week the new Mary Ann Gay strip begins, now penned by Lou Skuce. What an odd mess. There was almost the germ of an idea there at first...trouble is, I can't figure out whether we were to side with Nell, the "new woman" who wants to make a difference, or her old man who thinks it's all bunk. And I still can't figure out what the deal she made with Stilwell is all about. Awful, but interesting. Was the Mary Ann Gay strip any better? Only read the first few days of Mary Ann Gay; it was even more text-heavy than Little Nell (which is going some) and looked to be headed toward the same sort of scenario. Maybe someday after I've had time to forget the agony of reading this series! The syndicates have followed a rather conservative policy in adding new comic strips during the last year (mid-'49 to mid-'50), a check of the E&P Syndicate Directory shows. The comic strip mortality was 19—and syndicates have added 29 new strips. 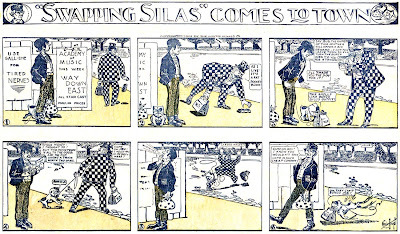 In some cases, a strip's disappearing act was directly connected with the emergence of a new one. "Dr. Bobbs," for instance, a strip which Elliott Caplin wrote, fell by the wayside when Mr. Caplin began doing continuity for a new prizefight strip, "Big Ben Bolt." (John Cullen Murphy is artist for the latter King strip). Cartoonist Bob Schoenke let "Jack Armstrong," the all-American boy, go, to concentrate on "Laredo Crockett," new Western strip offered by Des Moines Register And Tribune Syndicate. "Just Kids"—a comic title around for some time is missing this year, but Ad Carter's King page, isn't. Its name has been changed to "Mush Stebbins" and the characters and drawing were modified a bit. Included in those biting the dust were: a revival of an old-time humor strip; a strip discontinued after the cartoonist died; one whose artist wouldn't turn his work in on time, and anyway, the syndicate feels humor is the most marketable commodity right now. And, amazingly, a western strip. Several new comics listed in the directory are not yet being produced. In two cases syndicates haven't cleared up all the routine details for launching them. In a third, the syndicate looks at the Korean situation with baleful eye, and waits and wonders. Vested interests are apparently convinced of the great pulling power of comic strips and keep trying to identify themselves with what goes on, according to some notes we made recently. Arthur Folwell of "Mr. and Mrs.," New York Herald Tribune Syndicate, says use of a bottle of chutney in the strip, no brand mentioned, nevertheless brought a letter of thanks from some chutney people in India. A concern whose zippers are allegedly catch-proof posted paeans to Mr. Folwell after a strip showed a full-scale operation to get a zipper undone. Seems the zipper company had been sent a lot of copies of the strip by customers who hadn't had to operate. "It's one of many instances where we get a response from a man who makes something—who is grateful for help we didn't intend to give," says Mr. Folwell. Frank King, of "Gasoline Alley," Chicago Tribune-New York News Syndicate, also talks about "veiled personal interest in comic strip characters." "A lot of people would like to have their products mentioned in the strip," says Mr. King, who received baby carriages, a baby chair with a silver name-plate on it, bassinets, etc., after the arrival of Baby Skeezix. As a service for advertisers and agencies, the National Cartoon Associates has been formed by Ernest Bache, Joe Pena, Harold Betancourt and Harrell Holmes, with offices in New York City. The firm prepares panels, gags, spots and strips for ad campaigns. Rod O'Keef was worried about the state of holidays: "Last New Year's showed a steep increase in hangovers . . . Lovers' quarrels on Valentine's Day . . . Tree chopping on Arbor Day . . . Hunger at Thanksgiving . . . Even the ground hog refused to live up to his tradition." As young assistant to do-gooder "Mr. Holiday," whose beard is the Toni twin of old Kris Kringle's, Rod O'Keef sets out with pure, high hopes to get holidays on a better basis. He encounters villains along the way, which makes for continuity. The new daily George Matthew Adams Service comic is titled "Mr. Holiday" and is drawn by 23-year-old Fran Matera, used to do AP's "Dickie Dare," and the Marine Corps' comic "Ship to Shore." Young Chad Kelly, who had done a number of comic books, writes it. Are there any notable examples of product placement in comic strips?